Hey guys! Hope I got your attention with this headline! Looking forward to helping you guys! Your build looks nice, but without windows all around and access between the cab and cabin, it wouldn’t work for me. Hey, thanks for your opinion. There actually are windows all around, so you can see whats going on around you. You just cant go to the cabin from the back. Windows really make a huge difference in the livability of a rig. I’m curious as to why you opted to not be able to move freely between the cab and cabin. I would really miss the convenience. Well, there were actually several reasons for that. First of all - safety first. There are some legal regulations and here in Europe it is not that easy to do a van conversion and simply hit the road. If something bad would happen, you might get yourself in huge trouble. Police and insurance company especially would have a big issue with that. In such a case they can deny any insurance pay-off and you can imagine how expensive it can get if you consider the damage on vehicles, property or even health. So as I mentioned above you need to make sure there are no sharp edges, everything is anchored properly etc. So this is most likely the biggest issue we needed to face to. The other reason is that we needed as many storage space as possible and we definitely wanted to have the pull-out kitchen cabinet in there. Considering the very limited space in the car, we needed to put it right behind the driver’s seat. On top of that we had a requirement to have 3 seats in a front and there is no space to walk through to the back anyway. In my case it’s only me, or an occasional single passenger, but I can also seat up to three in the back, with seatbelts. Insurance here in the USA is a huge rip off. 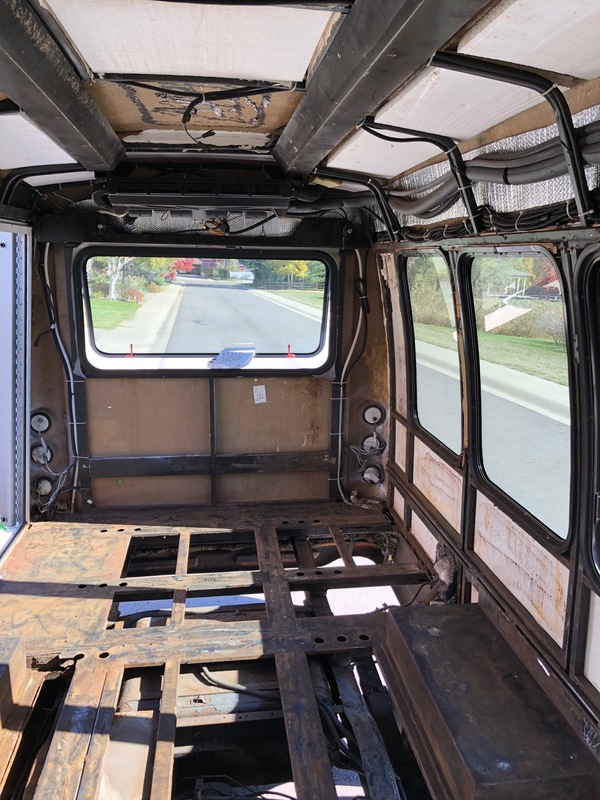 When I had a cargo van that I converted, I got hit by an uninsured driver, and my insurance company refused to pay because it was a commercial vehicle that was converted. Lucky for me only the side doors got damaged, so were pretty easy and cheap to replace. With converted passenger vans, I’ve never had that problem at least. I’ve never been at fault in an accident, thank heavens, but I’ve gotten rear ended while waiting at a traffic light many times. I love it. It is just looking antique and dreamy. I would love to travel in this van or have a coffee in it while static position near a hill station. All in all, you designed it in superb manner. Thank you so much, Herma! We are so happy, you like the result Well, do you know what? We decided to share our happiness with the others so if you would have a journey to Czech Republic, let us know and you can rent it :)) Thank you again! Thanks for describing the situation in US, I always wondered how it works out there! It’s a really nice design, I know about rules here in Europe but if you have a van for passengers you can move between cabin and back. Hey! Many thanks for your message. 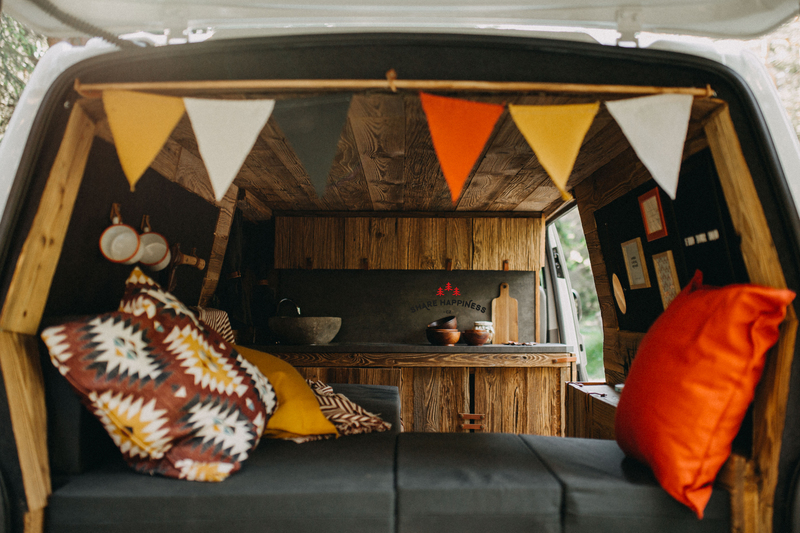 You are right, you can, however we converted it into campervan and because there is wooden interier with the sharp edges, it is better to have the space devided. Safety reasons. 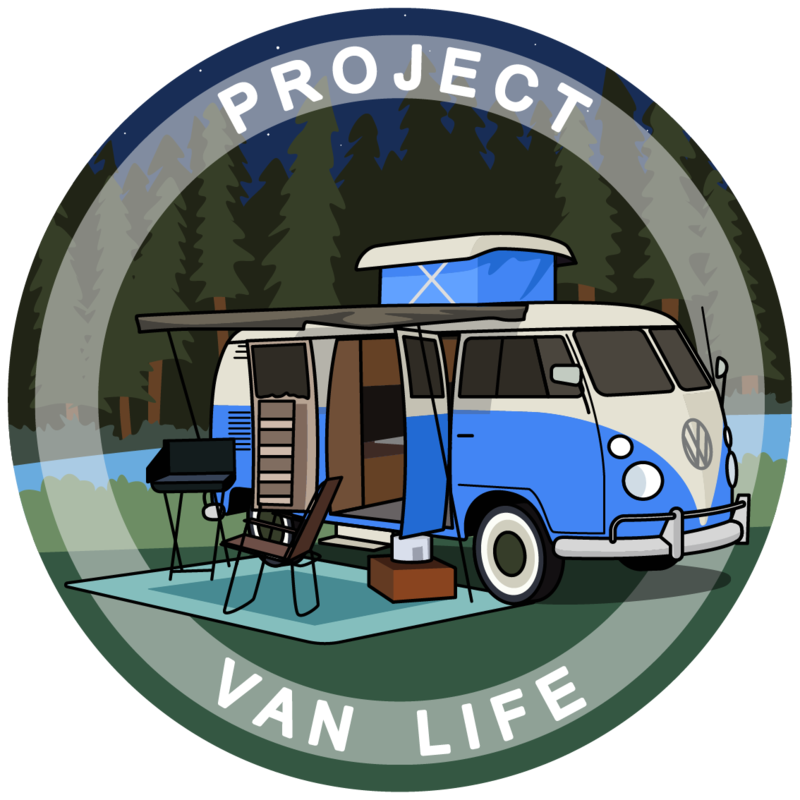 We officialy made a change in our technical documentation of the van. I like it. Personally, I’m a log cabin kind of guy and would love to build my van to look like one. I hesitate though because it seems like most people do that. Where in the Czech Republic are you? I lived in Prague and taught English! Prague is still my favorite place I’ve ever lived! Speaking of windows… not only do they contribute to livability, but glass is superior in terms of resistance to heat flow (R-value) and thermal conductivity (U-value) to the typical metal siding of a van. If my Googling has served me well, I am calculating that glass has an R-value that is about 77 times greater than steel (for reference, Expanded polystyrene (EPS) rigid insulation is 1200 times more resistant to heat transfer than steel). Glass weighs less than steel, too. About 2.6 times less, for the same volume. And of course, you can see through glass. My shuttle bus conversion is on a Turtle Top Van Terra base, which has windows all the way around the cabin space. I hope to be able to open it up fully to take in all the views and the light. Or, if I need privacy and/or insulation, I will have multiple layers of window covers, blinds and curtains to box myself in completely, or provide privacy with some light still getting through. Flexibility is key for me. I debated long and hard about vehicle selection and windows. In the end, I figured that glass is better than steel for my needs, even without the benefits of livability. And yes… I am taking almost everything in my conversion this seriously (and empirically). Does anyone want to know the “R-value to weight ratio” of common van conversion insulation materials? I would love to see any pictures you might have of your shuttle bus conversion! I’m really curious to know what kind of gas mileage you get with it. From everything I’ve been able to learn, they get between 8-10 mpg. As much as that would be the perfect size for me for full-time, long term van life, I would just want a higher mpg. I’ll send some pics of the actual work and share my Instagram account soon. Here’s the inside after demolition was complete, but before I did a major re-engineering of the shell which was required due to rust. When the bus was fully loaded with 9 extra seats, a wheelchair lift and a lot of extra weight all around I was getting about 13 MPG overall. I am sure I dropped over 1000 pounds (including the rear heater/AC unit and the very heavy wheelchair lift). Oh, did you? That’s awesome! when did you teach here?